I was 11 years old when I first heard the Beatles. By the time I was 12 there was no question about it, I had to have a guitar. I was fortunate. Dad bought me a very used Stratocaster for $150 USD. I saved up $200 to by a Fender Deluxe Reverb amplifier. But some of my friends couldn’t afford Fender, so Silvertone amplifiers were the next choice. Looking back, there were some other fine amplifiers that were probably in the same price that came with finer construction, but a Silvertone amplifier was so accessible. The inner working may have been slightly different, but they were well made. In the 1960’s we had no internet, no amazon.com, no Musicians Friend. 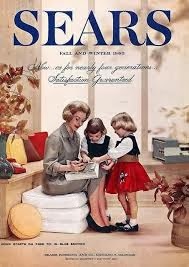 Heck we had dials on our telephones instead of buttons.Twice a year we would get a big Sears catalogue in the mail. Some lucky folks got both Sears and Montgomery Wards catalogs. My friends and I would head right to the guitar advertisements that promised, “a professional sounding instrument made of the finest birch.” The electric guitars were generally made by Harmony, Valco or Kay. Sears amplifiers originally were made by Valco, but by the 1960’s Danelectro was contracted to build amplifiers and put the Silvertone emblem on the grill cloth. Of course we all wanted the biggest and loudest amplifier we could afford. Silvertone came through, although there were some quality issues. The electronics were fine. The reverb sounded a little tinny, considering it was housed in the amplifier. Other than that it was a great amp, especially for the money. The problem was the cabinets. 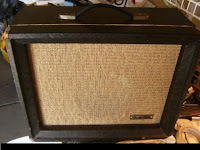 Silvertone/Danelectro used particle board to construct its cabinets while Fender used white pine. 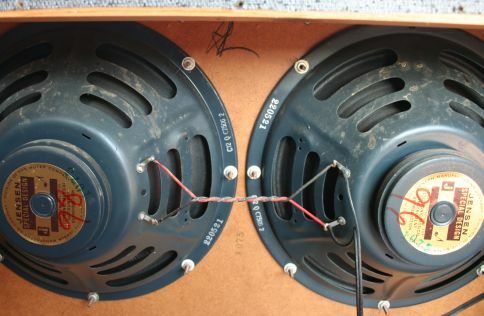 The other issue was the speaker baffles were constructed of ¼” masonite boards. You can see through the grill cloth some of the routing used for the speakers was not even round; it was just cut in a square placed in a diamond pattern. 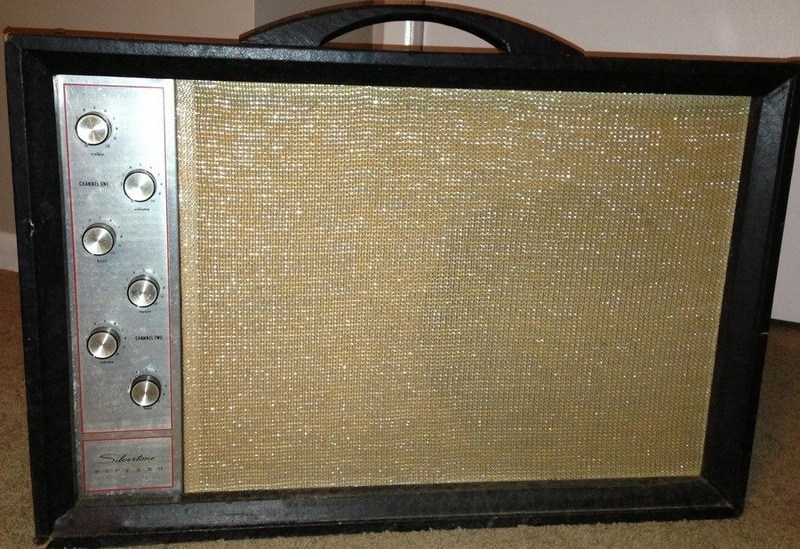 The covering used on most Silvertone amplifiers was merely inexpensive gray and black fabric that easily was damaged if the amplifier was knocked against a corner. Frequent bumps and knocks damaged the particle board. These amplifiers were purposely made on the cheap to be affordable to everyone. However the electronics in the Twin Twelve amplifiers did not seem to be adversely affected by the cheap cabinet design. The story was different for the tube bass amps. The speaker rattled like crazy. Tightening the nuts and screws on the basket did help a little. Possibly the best fix was to remove the particle board and replace it with solid wood. As the years went on to the later 1960’s bands tended to become louder. 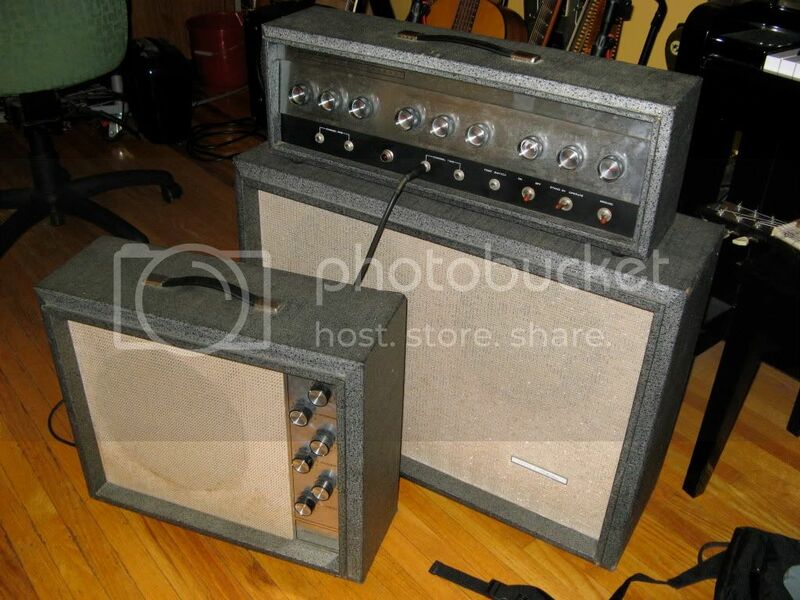 The Twin Twelve models were around 50 watts, similar to a Super Reverb and generally had no trouble being heard; however the Sears bass amps were only around 23 watts, which were not loud enough. In those days, no one thought of miking the amp through the PA system. This is the model 1473 with a 15" speaker. Today what amazes me is the amount of money these old amps are commanding. Possibly the best and the most desirable Silvertone amplifier is what we referred to as the Silvertone Twin Twelve or model 1484. This amplifier came with a speaker cabinet that was slightly smaller than a 1963 Fender Bassman or Bandmaster. The closed back cabinet enclosed two 12” 8 ohm Jensen speakers wired in series. In the bottom of the cabinet there was a space to store the separate amplifier unit for travel. The 1484 amplifier came with a non-removable 25 foot cord that attached it to the speaker cabinet. The amp produced 50 watts of tube power, which theoretically should have been at least as loud a Fender Super Reverb. However it was not due its design. This 50 watt amp came with two separate channels, each with two inputs. Each channel came with knobs for volume, bass and treble. As true with Fenders of that era, one channel had no effects and the other was connected to the reverb and tremolo. The tube complement consisted of 2 - 6L6GC power tubes, 2 - 6CQ7 – one was the phase inverter and the other was the reverb driver – 3 - 12AX7 preamp tubes and another 12AX7 for the tremolo circuit. The rectifier was solid state. Because of the voltages on the power tubes, Fender amps were much cleaner than Sears amps, however these Silvertone models deliver a nice compressed sound. The Bass and Treble controls are interactive with the volume. The higher you turn up the bass and treble produces more gain this amplifier produces. One trick, most owners of the 1484 figured out was to turn the amp’s volume all the way down and then turn the reverb potentiometer all the way up. This produces some other-worldly stuck in a cave sounds. In 1963 and 1964 you could buy a 1484 Twin Twelve for $149 USD. 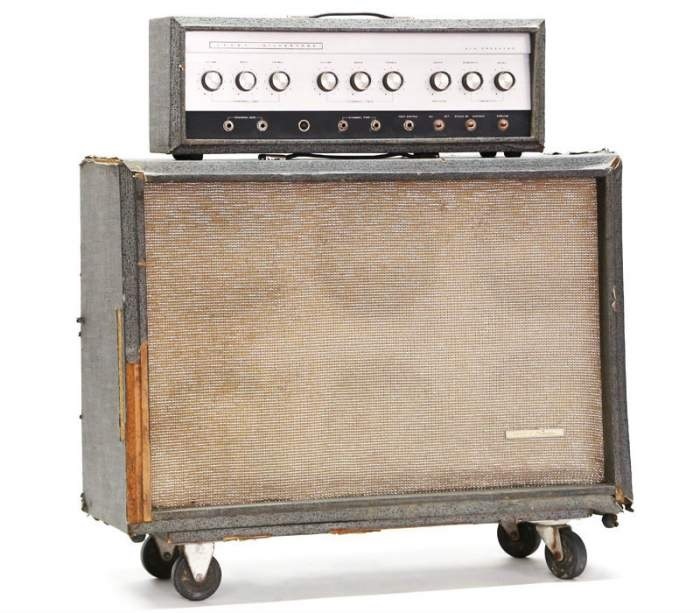 As guitarists yearned for louder amplifiers, Sears produced the 1485 amplifier. 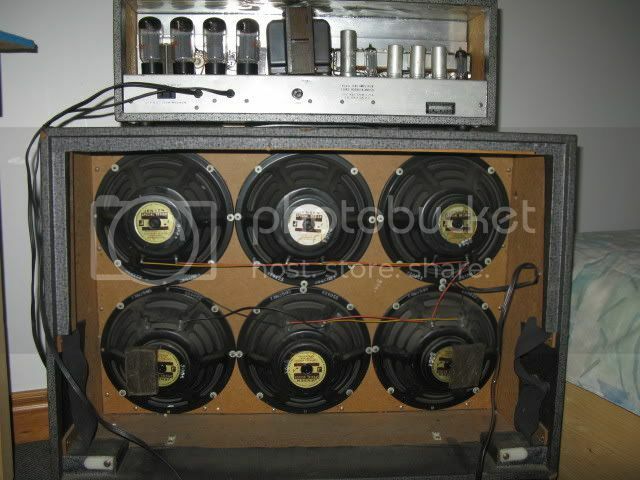 The circuitry was similar to the 1484, except this amp had 4 6L6GC tubes and produced 100 watts of power. And instead of twin 12 inch Jensen Special Design speakers, this amp came with six 10 inch Jensen Special Design speakers. The Silvertone 1485 amp came with a complement of ten tubes. I saw two websites stating it had 5 rectifier tubes, which I find hard to believe. From looking at a schematic I know the amp had 4 6L6GC power tubes team up in pairs and 2 6CQ7’s. One was the phase inverter and the other was the reverb driver. That left 4 12AX7 tubes, 3 of which were preamp tubes and the 4th took care of the tremolo circuit. 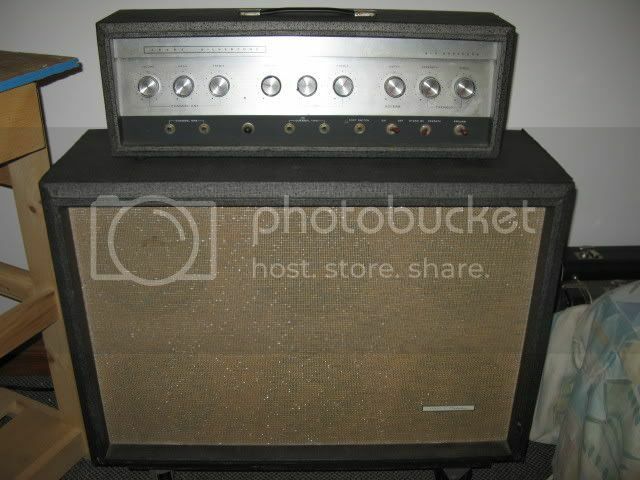 In 1965 the Silvertone 1485 amplifier could be yours for $239.95 USD. My best friend played bass. He saved up his school lunch money and sent off for a Sears 1483 and a matching 1444 Dano made single cutaway-single pickup bass. This was the bass guitar with the dolphin nose headstock. 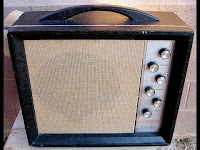 The Sears 1483 was a 23 watt amplifier that came with a 15 inch Jensen Special Design Speaker. I do not know why the wattage was only half of what the guitar amps produced. My thought is Sears/Danelectro wanted to keep the sound down to prevent speaker rattle, which is just what happened to my friends amplifer. 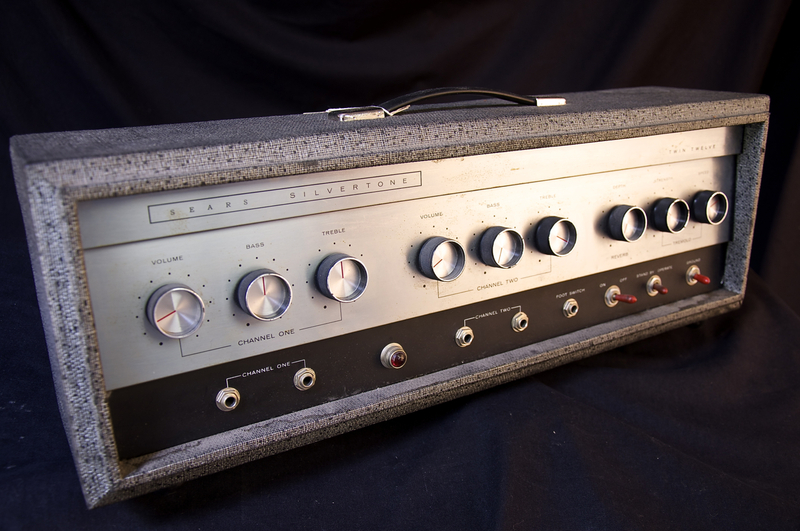 The 1483 Silvertone Bass Amp was a two channel amplifier with two inputs for each channel. The channels were identical and there were no effects. The tube complement included two 12AX7 preamp tubes – one 6FQ7 phase modulator – one 5Y3 rectifier tube and 2 6L6GC power tubes. The controls were volume, treble, bass for each channel. The switches on the front were standby / operate, the all important ground switch and an on/off switch. In 1963, wall outlets accepted only electric cables with two prongs of equal size. A guy could get a shock if he touched a microphone connected to a P.A. with reverse polarity. The biggest issue was 60 cycle hum through the amplifier. The ground switch prevented both situations. 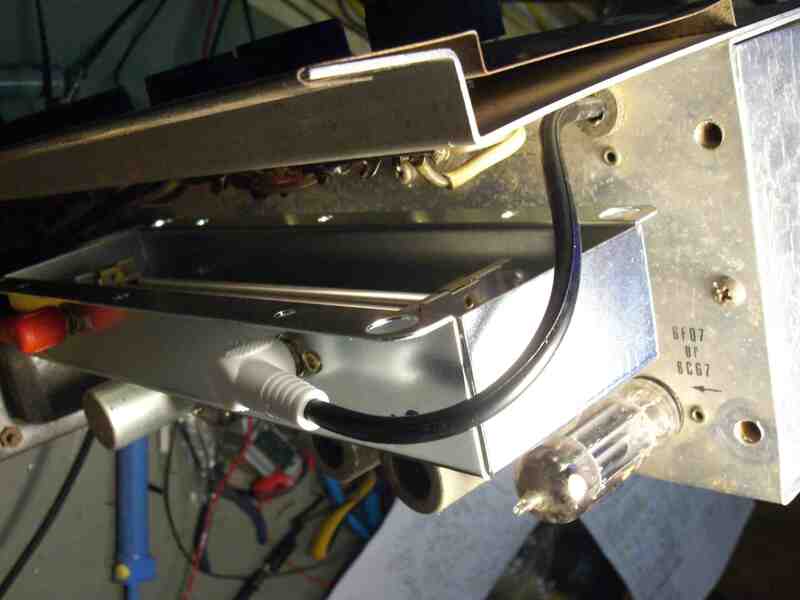 Despite being called a ground switch, it really did not 'ground' the amplifier. The model 1483's 15 inch Jensen speaker that was housed in the cabinet and had a huge magnet. The cabinet design was different from the 1484. The speaker was mounted on the left side of the cabinet and the storage area for the amplifier was on the right side and the amp head was stored vertically. 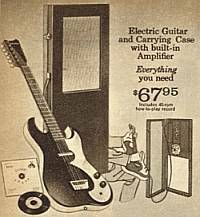 In 1963 and 1964 this was a bargain at only $99 USD for the amplifier and $79 for the guitar. My dear friend Doug went crazy due to the rattling speaker, so he replaced it with a Utah speaker. Then saved up and bought a JBL Lansing speaker. He then stuffed the back full of fiberglass insulation. He finally saved up enough for a Fender Bassman. In my opinion the 1483 would have made an excellent guitar amp as it produced as much power as a Fender Deluxe, only the Sears amp used 6L6 tubes instead of 6V6’s. 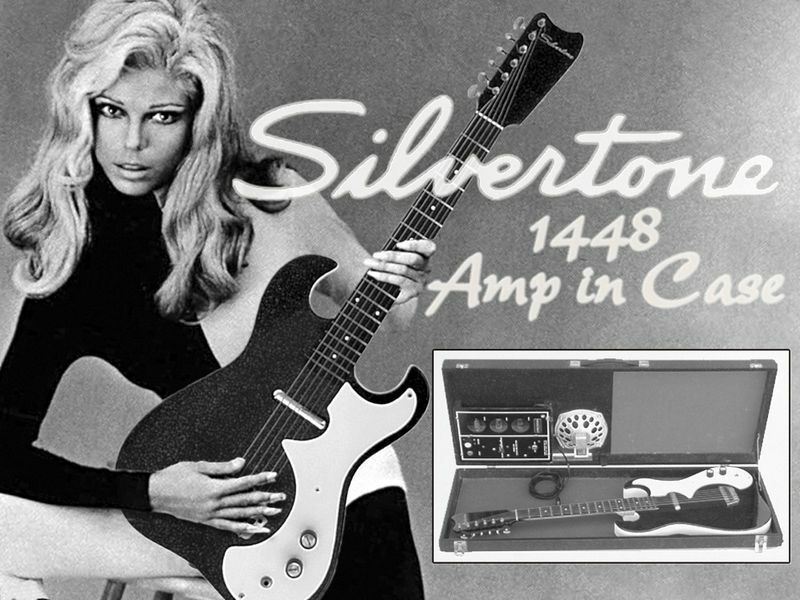 The predecessor to the 1484 was a combo amp designated as the Silvertone 1474. 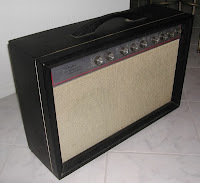 This amplifiers circuitry was similar to the 1484, however it was a combo amp and was made by Danelectro. In fact it was similar to an amplifier Danelectro sold under it's own brand called The Twin Twelve. The amp included twin Jensen special design speakers, two channels; one clean and one with effects. Each channel had a volume, treble and bass control. The 1474 came with a Hammond reverb unit and tremolo. It produced 50 watts from 2 6L6GC power tubes. While the model 1484 came with grey and black fabric covering, the model was 1474’s covering was solid black with white piping around the front of the cabinet. It sold for $139.95 in 1961 and only was offered for one year. As for the smaller amplifiers that Sears and Roebuck offered, the first was the Silvertone 1471 was built by Danelectro to compete with Fender’s new Champ model. This amp produced 5 watts of power into an eight inch Jensen speaker. It came with a volume and a tone control. This model sold from 1961 to 1962. 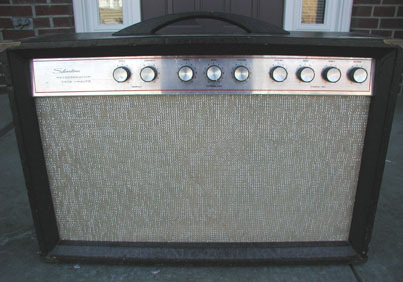 The Silvertone 1472 was the next model offered and was sold from 1961 to 1963. This amp put out 10 watts into a 12 inch Jensen special design speaker. This dual channel amplifier controls were volume, tone, volume, tone and it came with tremolo controls labeled speed and depth. It sold from 1961 to 1962. The 1482 was offered in 1963 through 1968. It too came with a Jensen 12 inch special design speaker. Both amps sold for around $69 USD. 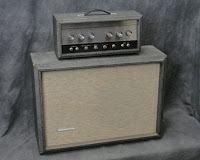 The final Silvertone amplifiers that were very popular in the 1960 decade were the amp-in-a-case models. 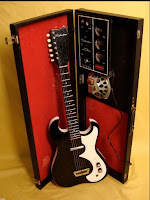 Silvertone offered two models in the 1960’s; four if you considered the value of the guitar that came with it. 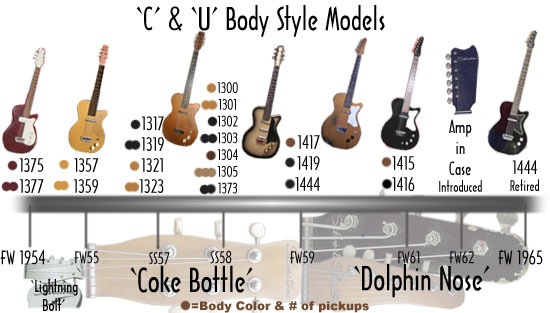 From 1962 to 1965 Silvertone offered models 1448 and 1457. Both were made by Danelectro. The wooden guitar cases came with a section of gray grill cloth which hid a tiny 3 watt tube amplifier with a five inch speaker. The speaker frame was designed to prevent damage to the speaker. 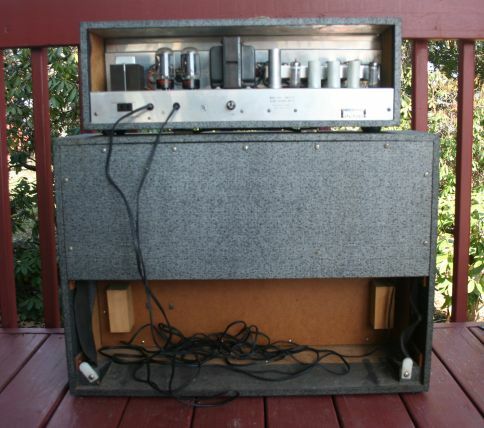 The model 1448 amp had a rectifier tube, a preamp tube and a 6V6 power tube. There was one volume control. 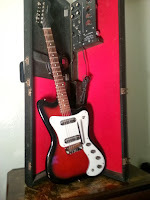 The player would remove the guitar and stand the amp on its bottom side with the case opened to hold it upright. There were some differences in the 1448 and 1457 models. 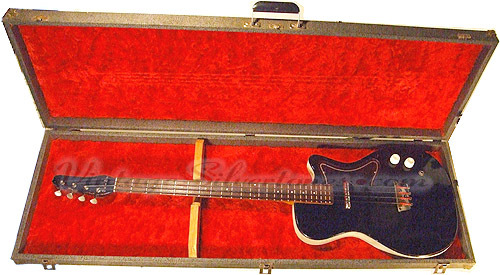 The 1448 came with a single pickup Danelectro masonite guitar and only a volume control on the amp. 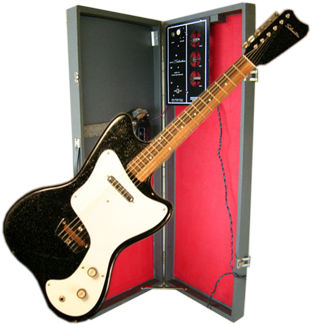 The 1457 model contained a twin pickup Dano guitar, a volume and tone control, tremolo knobs, cord, footswitch and a 45 rpm ‘how to play the guitar’ record. The 1448 sold for $68 USD while the 1457 sold for $100 USD. Prior to the introduction of the 1457, the model was designated the 1449. The 1449 was first made available in 1963 and replaced by the 1457, which was essentially the same amplifier and guitar. The 1448 sold from 1962 to 1965 and the 1457 sold from 1964 to 1966 when both were replaced by the model 1451. 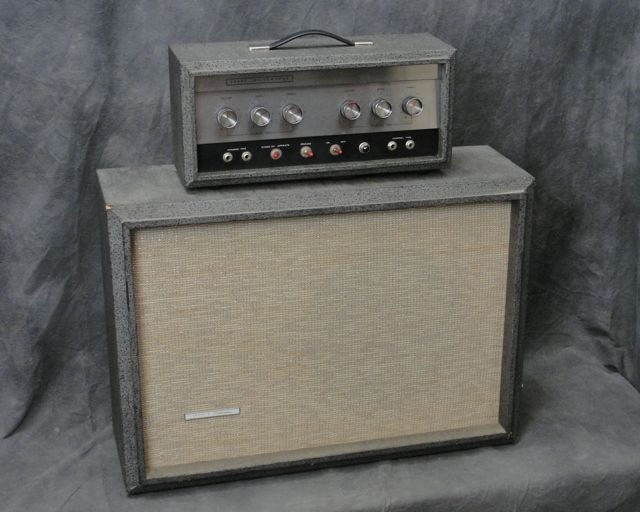 The Silvertone model 1451 came with a giant six inch speaker attached to a three tube (rectifier, power and preamp) and a single volume control. 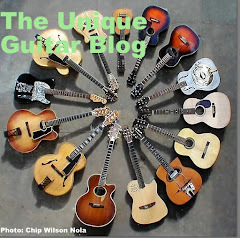 The guitar was made of wood instead of masonite on a pine frame. The neck and headstock were still the same. This baby pushed 5 watts of power. The Silvertone/Danelectro model 1452 came with an 8 inch speaker, 5 watts of power, 4 tubes and a Danelectro solid wood guitar with two lipstick pickups and a tremolo bar. The 4 amp controls supported volume, tone and speed and depth for the tremolo. 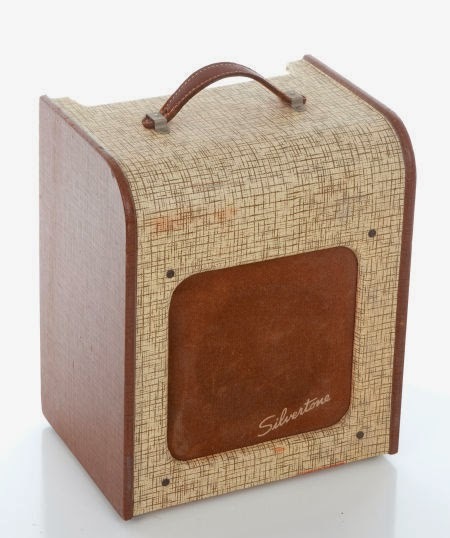 One amp-in-case/guitar combo worth mentioning is actually from the 1940’s. This unit was made by Valco and designated the Silvertone 2323. The amplifier unit was housed in the guitar’s case. It produced 3.5 to 4 watts of power through a rectifier, power and preamp tube. The speaker was 6 and a half inches. The only control was volume with a chicken head knob. 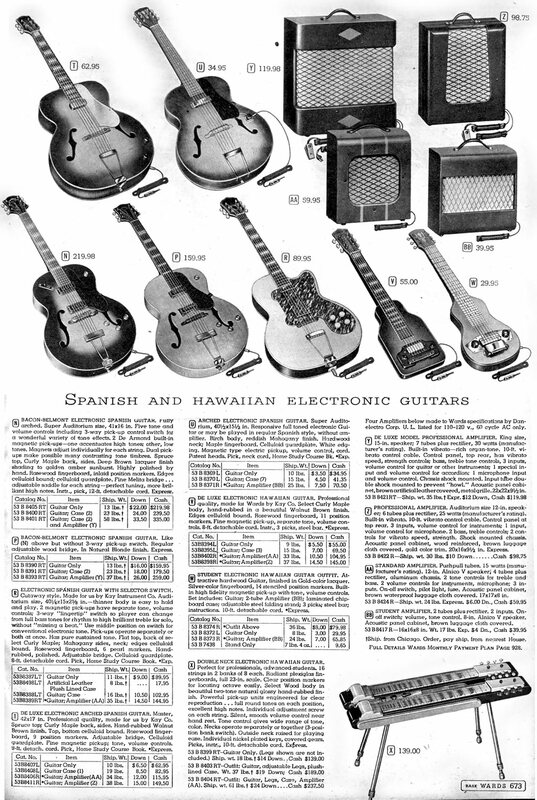 The guitar was a lap steel also made by National/Valco. It was made of wood with a mother-of-pearl covering. It came with a single pickup and a single volume control and a Roy Smeck Guitar instruction book. These instruments are extremely scarce. I am starting to read your blog!! I hope you will find something interesting on mine as well! Wow, that article could have been written by me! In 1964 I formed a rock band with three of my friends in junior high in North Vancouver. I was the rhythm guitarist. I only had an old acoustic at the time and my parents had no money. 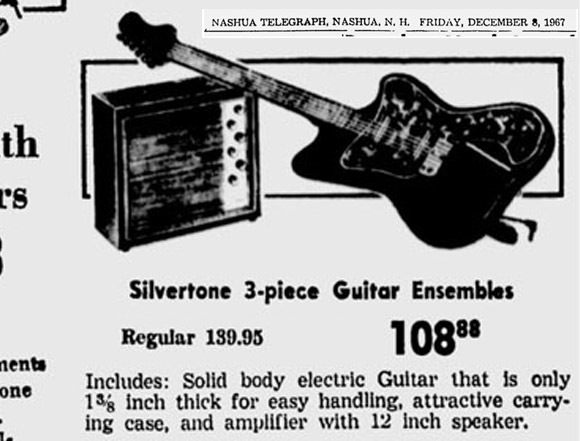 But they managed to buy me a Silvertone Amp and Beltone guitar from Sears Canada (and $108 would have been a lot of money for them, so thanks, Mom and Dad!). But my friend Jim, who was our lead guitarist, had parents with money and they bought him a Fender Deluxe Reverb and a Strat. Thanks for bringing back the memories! Hello a friend of mine played guitar in 1975 thru a silver tone amplifier it had 6 12 inch guitar speakers and seperate amp head the cabinet sat straight up it maDE A RATHER tall amp setup DO YOU KNOW WHAT MODEL THAT WAS I THINK IT WAS 100 WAtts it was damn loud. 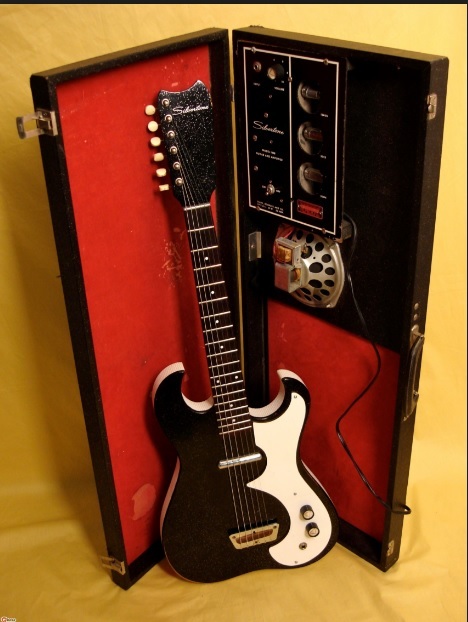 In about 1967 I bought a Danelectro that had 8, 10" speakers. I have never found it on line or in any catalogue. I'm just curious if anyone else ever heard of this amp. 12 volt refrigerator is an indispensable item in the family, but not everyone understands it, thank you for giving me this information. Hi, can you tell me what make the guitar amplifiers sold to pair with the Synthe-Guitar sold in the Sears catalogues are please? 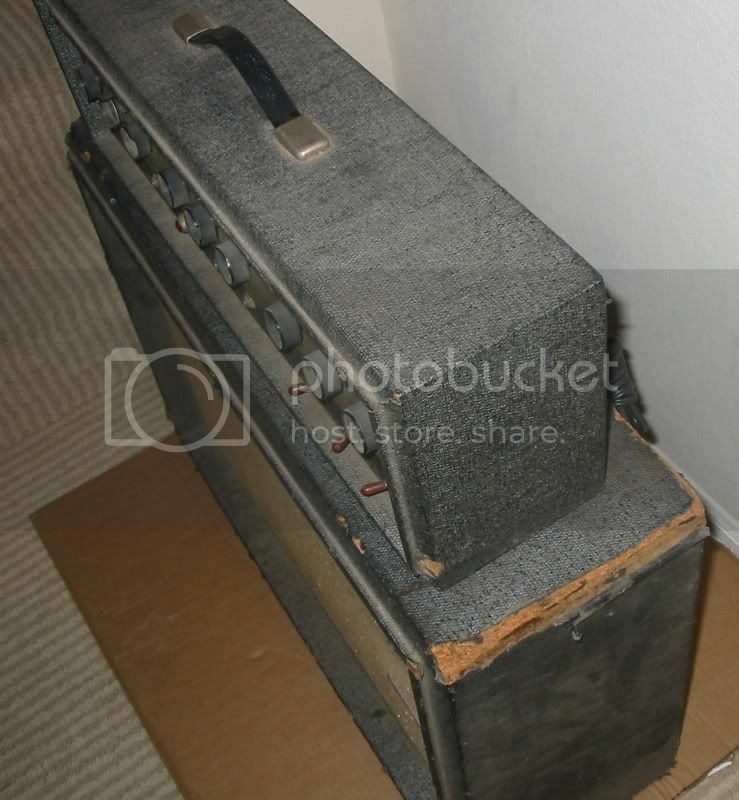 It states on the page: '65-Watt (PMP) Guitar Amp' I have done some searching but can't find out anything. I'd like to get one to go with my Univox. Headphone with built in amp that where sold for the guitar too.